Have you ever been blown away by something so amazing you just HAD to share it with the world? That’s how I felt when I sat down with Julie Lackie, CCT (Certified Clinical Thermographer) and she schooled me on the ins-and-outs of Thermography aka Thermal Imaging aka Digital Infrared Thermal Imaging, among many other technical names. I had heard of Thermography before, but I was under the impression that it was just the latest and greatest new non-radiation form of beast imaging. I had heard that it could detect cancer cells far before they would show up on a mammogram, which was enough to convince me right there, but I had no idea how powerful this technology is in detecting all kinds of disease processes that are forming in the body. First of all, Thermography is not limited to imaging only the breast. It can actually be used to image the body from head to toe. It can detect cancer cells at a very early stage, but it also detects infection, inflammation, periodontal disease, fibromyalgia, arthritis, chronic sources of pain, thyroid problems, even changes in the body that can lead to stroke or heart disease. I don’t know about you, but if any of these things are even beginning to develop in my body, I’d want to know sooner than later! 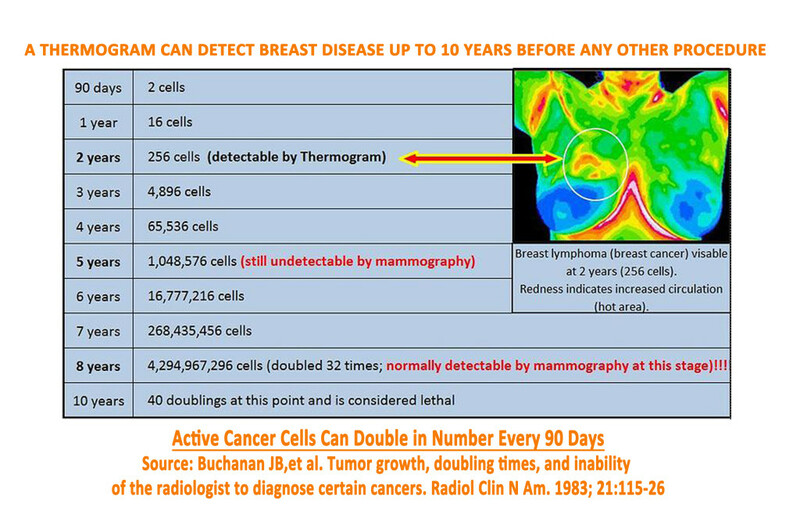 Just to give you an idea of how far in advance Thermography can detect disease, let’s use the example of breast cancer cells. When cancers begin to grow in the body, abnormal cells begin to multiply at a rate of doubling every 90 days, and clump together into what we eventually refer to as a tumor. Sometimes these tumors become big enough to detect manually. Other times they are picked up on routine mammograms. By the time they are visible on the mammogram, they have typically been growing for a number of years. Thermography can detect cancer cells when the tumor has grown to as little as 256 cells, if you can even call that a tumor. However, that same tumor would not be detectable by mammogram until it has reached a size of over 4 billion cells. Yes, you read that correctly. In fact, here is a chart depicting the growth and age of detection of cancer cells in breast tissue. After my jaw dropped open, Julie shared case after case with me of patients who had chronic health conditions that no one could solve, until they got thermographed: gut problems that were coming from the mouth, shoulder problems that were coming from the gut, and every imaginable combination of health issues that were finally once and for all solved once the imaging was done, and proper nutritional protocols were put in place for the body to heal. We know that mammograms, CT’s, x-rays, and many other types of imaging expose us to radiation. . .which, by the way, causes cancer. Thermography works differently, as I will explain in a bit. It is safe, non-invasive, FDA approved, there are no side effects, there is zero pain, no nasty compression like you get during a mammogram, and no contact with the skin whatsoever. Mammograms (which are x-rays of the breast), x-rays, CT’s and many other traditional imaging techniques use electromagnetic radiation that is beamed through your body in order to create images that can be read based on how well those x-ray beams penetrated. In other words, they burn little holes through your body, and those beams have an easier time getting through soft tissues such as fat than they do getting through dense tissues such as bone. So, each tissue density will create a different color on the film, and doctors can usually determine what’s what based on the changes in anatomy that they see. Thermography works very differently. Rather than emitting anything, it only detects changes in heat and temperature of the body. There is no radiation burning holes through your body, but instead, pictures are taken of various areas and the thermal image is recorded digitally, like a digital photo. Then, based on what the doctor sees in these images, he or she is able to determine changes and patterns of thermal activity that differ from normal function such as is the case with inflammation or an increase in vasculature to an area. Although biopsy is the only difinitive way to verify cancer in any cell, thermography has about a 97% accuracy rate in determining benign vs malignant breast abnormalities. And keep in mind that it detects cancer cells years before they grow into large tumors that are harder to treat. Most of the clinical research out there has been done specific to the breast and I’ve included references below. But it accurately detects functional problems all over the body that no other imaging out there can. I’m Ready. . .How do I Sign Up? 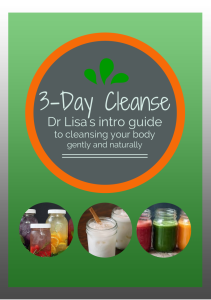 With nearly 20 years of clinical experience in the healing arts profession, Dr Lisa Giusiana uses the knowledge-base she has acquired from her degrees as a Doctor of Chiropractic, Certified Traditional Naturopath and Holistic Health Practitioner to share what she knows and help others THRIVE and Live Fully Alive. Just scroll down to Thermography to see the different packages, each includes the imaging, the written radiography report and the Report of Findings with nutritional recommendations.